Fall has arrived and brought with it another season of landscaping. Fall landscaping is great for making your property look beautiful as well as preparing your yard for the winter ahead. Take advantage of this season and get the most out of your landscaping. In New England, your lawn is most likely a cool weather lawn which makes fall an important season when caring for it. Taking good care of your lawn during the fall helps to prepare it for winter and ensure it is full and healthy for spring. You’ll want to rake your lawn throughout the season. While the colorful leaves may look pretty on trees, they can leave your lawn with bare patches come spring. 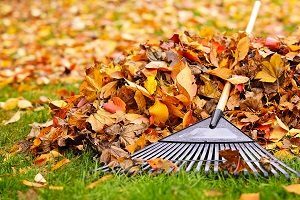 Pay particular attention to the corners of the yard where leaves may pile up and be sure to clear them all away. Keep cutting your grass throughout the season but pay attention to height. You’ll want to keep your lawn at 2 ½ to 3 inches for the majority of the season before cutting it down to around 1 ½ inches right before winter. Keeping your lawn longer for fall will give it time to fill in and grow a strong root system. Wait until late fall to do your final cut and finish preparing your lawn for winter. It may seem like the gardening season has ended with summer, but it has only begun. Fall is a good season to transplant trees and shrubs. The fall season leaves them enough time to develop roots before the winter hits, without much demand on foliage growth. During this time, you can also plant bulbs and fall flowers. October is ideal for planting bulbs in cooler climates such as New England. Popular choices for fall flowers include chrysanthemums, pansies, heather, and many more. If you wait until after the first frost hits, how you care for your garden will change. You can learn more about how to care for your garden after a frost here. Don’t neglect your hardscape during the fall. Winter can be hard on any stone walls you have, making fall a good time to fix them up. Reset any loose stones or blocks and replace any missing ones to help prepare your walls for winter. This is also a good time to fix up your driveway. If your driveway is cracked or uneven, filling cracks or resurfacing the driveway will make it easier to clear the snow off in the winter. This also goes for any walkways, pathways, or patios. Make sure to plan your projects accordingly so that they are all complete before the snow arrives. These tips should help get you and your yard ready for the fall season. If you want high-quality professional care for your lawn, garden, or hardscape, contact the professionals at Greener Horizon. In addition to our expert care and services, we also offer a free consultation to help you achieve the landscape of your dreams.